Today’s post is a little bit modified from a post I created a couple years ago. Since it’s Mental Health Awareness Month, I feel compelled to post something even if it’s almost the end of the month. We can always make efforts to educate ourselves about health issues. When I started writing this blog and was given the opportunity to create an About page, the idea was more than I wanted to consider. I played it lazy and kept it short. Later, I made the changes you see now. While the changes may not agree with you, they reflect the real me. I’m like anyone else, I suppose; I can talk about myself all day long. If we’re honest, we admit that we–or something about our life–are our own favorite subject. My About pages are general in nature. That’s okay, based on what they’re designed to do. Now I give you Mr. Espada’s poem as an adjunct to getting to know me. Also, as advice to follow. Truly. I’m sincere when I say that through my blog I hope to share my journey in finding joy and contentment with Jesus Christ. I also hope to sometimes encourage, comfort the weary, offer consolation, teach, break through spiritual obstacles or propel someone toward God’s purpose for them. However, I haven’t been totally honest yet. I’ve been wearing a plunger on my head, so to speak. Unknown to some of you, I’ve been trying to be something I’m not. It’s time to reveal a secret. I have manic-depressive illness which is not totally controlled even though I take my medications as directed and try to do all the things my doctor prescribes. We don’t respond the same way as people who have what I call ‘respectable’ illnesses like asthma or heart disease or diabetes. People with those illnesses have physical manifestations if things get out of sync. With a mental illness, the manifestations can be physical, but mostly they’re behavioral. Maybe you’ve witnessed those manifestations. We just don’t act right. Taking Mental Health Awareness Month seriously means you educate yourself about the difference between multiple personality disorder and schizophrenia; whether someone is worrying or actually has anxiety disorder. 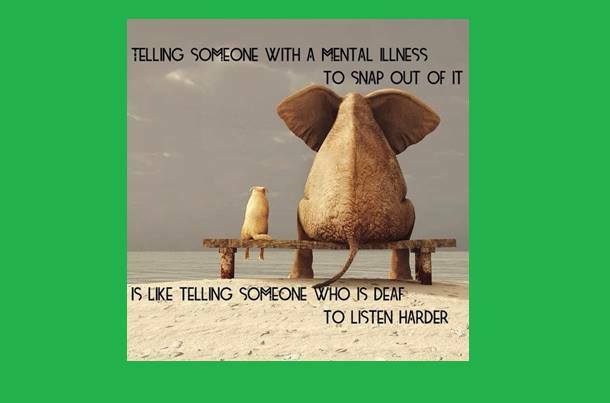 You might take it so far as to learn how to respond to those with mental illness. After all, one if five people struggle with some form. Your knowledge of what to do could make a big difference to someone in your circle of acquaintances. I’m not writing today to go into my story from the day I was diagnosed (and before). It’s not a pity-party. I decided to write for a couple of reasons. First, if you decide you want to continue reading my blog, it should be based on honesty. You don’t have to be honest, but I need to take the plunger off my head. Then you’ll see me as I really am. Second, the Church is becoming more aware of its role in meeting the needs of those in their communities who are mentally ill. It’s encouraging to see this. Some of the awareness has come because of family tragedies hitting like tsunamis in the news, or in our own lives. But the Church has a long way to go in this regard. If I write about my own experience, people may find it easier to just relax and accept us. We aren’t unapproachable. In fact, we might be some of the nicest people you can meet. I plan to share some of my journey here occasionally. I’m working on a book with the hope that people will help understand the struggles, believe that God is our refuge through it all, and to, oh what the what–maybe even tell some funny stories. There it is. I don’t pretend to know God’s ways, but I do know he invaded my life through manic-depressive illness like He’d never invaded it before. His voice has never been heard so sweetly to me as when he whispers, “I love you” as I crawl the walls or wail like a lost child. Heavenly Father, thank you that when we realize our identity in you we no longer need to pretend to be something we’re not. Grant us the ability to love one another no matter what physical, spiritual, emotional, or mental affliction is with us now. Heal us and sustain us as you see fit. Extend grace to us in our weaknesses for your glory and in the name of Jesus. Amen. *Although I have yet to call myself a unicorn. Congratulations on a beautiful post. I’m so glad you’re feeling better and enjoying your family visit. Thanks for sharing, Paula. Keep writing, and I’ll pray for your health, both mental and physical.